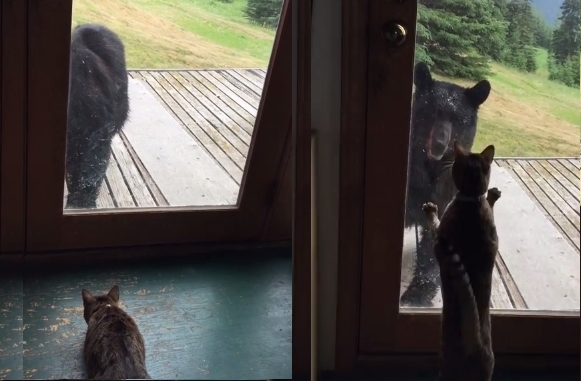 The last thing this black bear expected while innocently sniffing around a front porch in Eagle River, Alaska, was a not-so-scaredy cat leaping at him from the other side of a glass door. As is evident from the video taken by the home (and cat) owner Darliss Elliot, the shock from Savannah cat Nani’s sudden predatory lunge was unbearable, and caused the bear to lose his bearings and fall off the porch while rapidly backtracking. Elliot told local broadcaster KTUU that they saw the bear come up the front driveway and amble around the back, but Nani saw it only after it came onto the back porch. The appearance of the bear, a rather common occurrence in Alaska, didn’t surprise Elliot as much as the 2-year-old feline’s behavior did. Responses to "Alaskan Cat Scares Black Bear Away From Family Home"